If you're skipping the family-friendly portion of Halloween this year and are looking instead for grown-up thrills and chills, here's a sampling of events sure to scare the wits out of you. The granddaddy of local scream-throughs, the Haunted Kinetic Lab of Horrors is back Oct. 28 through 31, from 7 p.m. to midnight at the Kinetic Sculpture Lab ($12). This shriek-fest is recommended for ages 13 and over and features live music outside — to drown out the screams. Head down to the foggy docks at Waterfront and Commercial street for The Haunted 1091 Ghost Ship on Friday, Oct. 28 and Saturday, Oct. 29 from 6 to 10 p.m. ($10). Wear flat shoes for this one. You'll be creeping through three levels of steely terror (and you may need to run). Ages 12 and up only. 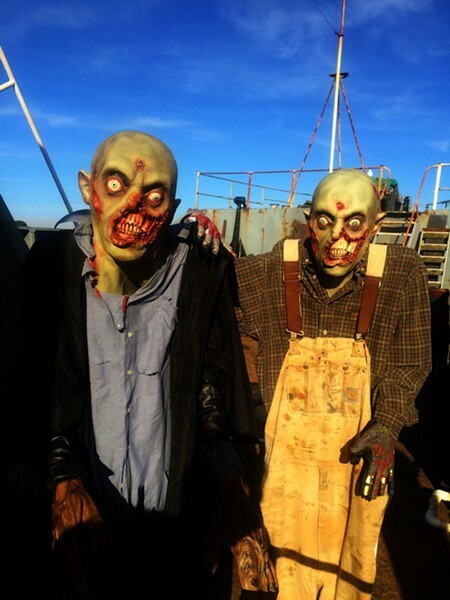 Ghouls, zombies and other crazies run amok at The Haunted Mill Tour at Blue Ox Millworks from 7:30 p.m. to midnight Friday, Saturday and Monday, ($12). No children under 13 admitted. Bring an extra pair of big boy/girl pants for this one. Tucked away in the rural reaches of Willow Creek is Dream Quest's Haunted House, happening Oct. 29-31 from 6:30 to 9:30 p.m. on Mayfair Drive, one block off of State Route 299 ($5). Apparently a film company of dubious reputation has set up a studio in Willow Creek ... Not recommended for children. And for an evening of macabre entertainment, don't miss Rotary Club of Southwest Eureka's spookfest, Cirque de Soulless: The Illusion, Saturday, Oct. 29 from 7 to 11 p.m. at the Sequoia Conference Center ($65, $60 advance). This one has it all: music, dancing, appetizers and ... terror!